Take a glance around the local area, and take your time to count the properties wearing Sold signs. You'll soon see huge numbers of successful Bacon and Company-branded boards - a clear indication on Read full description...Take a glance around the local area, and take your time to count the properties wearing Sold signs. You'll soon see huge numbers of successful Bacon and Company-branded boards - a clear indication on how we deliver for our customers. Much of our business comes to us by way of recommendation, and over the years we've acted for many clients time and time again. At Bacon and Company, our experience is what really counts. 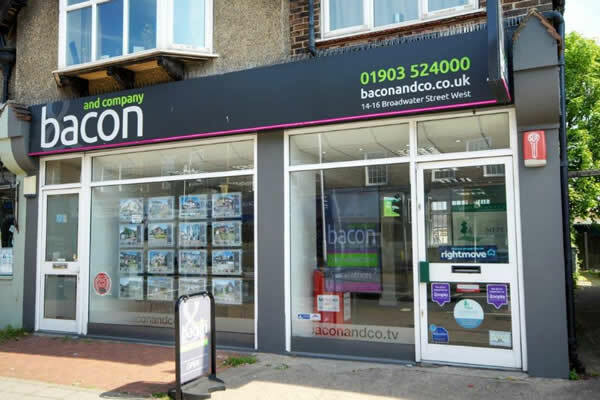 Bacon and Company is a welcoming and well-established residential estate agent covering the coastal strip of Worthing, Goring and Ferring, with offices in Worthing town centre, Goring and Broadwater. We're widely recognised as one of the leading agents in the area. We're proud to say our success is thanks to a team of high-quality professionals with a wealth of in-depth knowledge. Bacon and Company's directors Wayne Kenward and David Hughes have excellent reputations gained over the last 35 years, each being past presidents of the Worthing Estate Agents' Association. They're assisted by senior managers who between them have more than 100 years' experience of the region's property market. Our modern computerised offices offer a friendly environment for clients, and full-colour property details ensure each property is given the dedicated marketing it deserves, as well as striking representation in the local press. Naturally, we also publicise our sales properties on the internet at a number of sites, including our own property search, Rightmove and Zoopla. 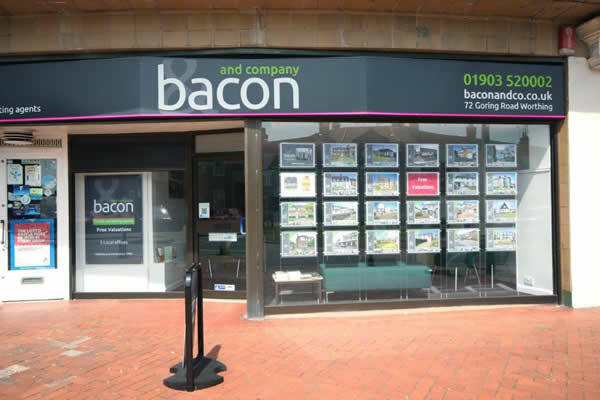 Bacon and Company has been individually chosen to represent Relocation Agent Network as the best local estate agent. There are around 650 independent estate agents in the national network, passing applicants and vendors to each other. 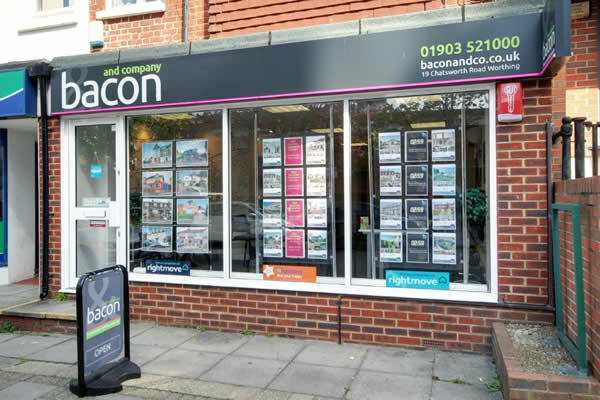 Bacon and Company is a member of the National Association of Estate Agents (NAEA), Worthing and District Estate Agents' Association (WDEAE) and The Property Ombudsman scheme, which ensures you peace of mind alongside our high levels of integrity and great service. But don't just take our word for it. At Bacon and Company we're proud to let our previous customers sing our praises, so please read what they say about us on the UK's largest agency review site allAgents. The fees were fair, I would rather pay an estate agent to take the pressure off and deal with the whole chain / solicitors etc. Very good. Also honoured an agreement of a discount. They definitely earned their money . N/A not my agent for selling. Very reasonable fees from the start. The fees were slightly higher than another agent who quoted but I am glad that I made that decision as their service was so good & stress free. We hope you will never feel the need to complain, but in the rare instances that this is required, please contact the branch for a full complaints procedure checklist.